With the launch of iPhone 8, Apple introduces an all‑new glass design improved camera and most powerful and smartest chip ever in a smartphone. 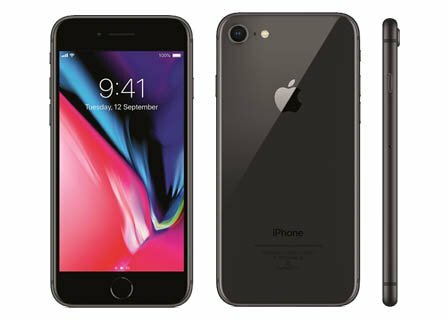 Apple iPhone 8 is featuring iOS 11.4.1 Operating System, 4.7 inches HD display, 12 MP Primary | 7MP secondary camera, Apple A11 Bionic processor, 64/256 GB Internal | No SD Card support | 2 GB RAM and 1821 mAh battery. The way handset is designed is clearly making it a piece of luxury gadget. It has ion-strengthened most durable glass ever in a smartphone, front and back. While the aerospace‑grade aluminum band that has perfectly created corners to fit in hands. The body is precision‑engineered to resist water and dust (IP67). Even after having a glass back it supports wireless charging. New 4.7‑inch Retina HD display that’s more beautiful than ever withTrue Tone, a wide colour gamut, and 3D Touch. True Tone technology automatically adjusts the white balance to match the light around you. offering the best colour accuracy, everything on the screen looks brilliant and vibrant. An advanced 12‑megapixel camera with a larger, faster sensor which is capable of taking sharp and colour accurate photography even in conditions where sufficient lighting lacks. It is also featuring OIS (optical image stabilisation) for photos and videos that definitely help you to take shake-free photos and videography. 7 MP secondary camera for selfie featuring Face detection and HDR is brilliantly taking amazing selfies. Handset is powered by A11 Bionic chipset which is up to 70 per cent faster than A10 Fusion and two performance cores that are up to 25 per cent faster. Playing games is now more fun, realistic and smoother as new Apple‑designed three‑core GPU is up to 30 per cent faster than A10 Fusion. This chipset also powers extraordinary augmented reality apps and games that will change the way you see the world. iOS is the most advanced and now in this handset the latest iOS 11 which is highly intuitive and secure mobile operating system in the world. There is 1821 mAh battery offering 14 hours of talk time over 3G network. It supports wireless charging so here no cable required to charge the battery. Apple also Introduces the AirPower mat Just set your iPhone, Apple Watch and AirPods anywhere on the mat to charge them wirelessly. A hard 4.7 inches display protected by Ion-strengthened glass. The 12MP stunning primary camera also featuring OIS. Fast Apple A11 Bionic Hexa-core processor. Can record slow-mo videos (1080p@240fps). There is no 3.5 mm audio jack support. It doesn't have a dual camera setup. Low screen resolutions with only 750 x 1334 pixels,. No LED flash for the selfie camera.